“Assistant professor of electrical engineering Luqiao Liu is developing new magnetic materials, known as antiferromagnets, that can be operated at room temperature by reversing their electron spin and can serve as the basis for long-lasting, spintronic computer memory. Stephanie Bauman, an intern in the Materials Processing Center and Center for Materials Science and Engineering Summer Scholars program, spent her internship making and testing these new materials, which include manganese gallium samples. 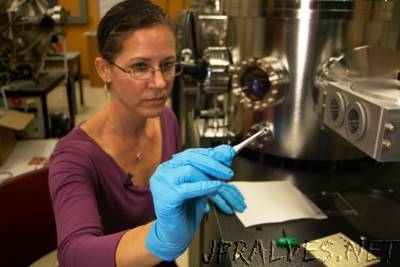 During a visit to the lab, where she synthesizes these thin films with a special machine called a sputter deposition chamber, Bauman said she always refers to a checklist to make sure she’s doing everything in the right order. In order to take out a sample from the machine, she follows a complicated set of steps, making sure its parts are correctly lined up and unhooking the sample holder in the main chamber. Because the chamber is pressurized, she must bring it back to everyday atmospheric pressure before taking it out. “Now that I can see that it disengaged, I go ahead and move it all the way back up,” she said. With the sample holder on a moveable arm, she is able to rotate it out. The sample moved across a gear arm out of the main chamber into transfer chamber known as a load lock. “A very, very important part of this is to make sure you close the transfer valve again, otherwise you mess up the pressure in the main chamber,” she said. After double-checking the transfer valve is closed, she brought the load lock back to sea level pressure of 760 torr. Then she took out the sample holder. “Sometimes you end up playing tiddlywinks. I know that some younger people don’t really know what that game is, but it’s what it looks like when you push down on the arm, and the sample goes flying,” she cautioned.